One of my favorite memories as a kid is sleepovers at my grandma’s house. In my mind, nothing could top them. My grandma always had the best food for us and one of my favorite things was what we called “GORP.” Ever heard of it? It was made up of Cheerios, M&M’s, peanuts and raisins. We loved it. We’d take it everywhere . . .vacations, the swimming pool, picnics. I’m not sure why we just didn’t call it trail mix. . . maybe way back then, the name “trail mix” hadn’t been coined yet, who knows. I just know we absolutely loved GORP. If I remember right, there always seemed to be an abundance of raisins left, probably because we were all “pickers.” We all went for the good stuff. I actually like raisins in trail mix, just not in cookies. There is something about cooked raisins . . . yuck! Now onto these cookies. They are completely awesome. I’m not kidding, I couldn’t get enough of them. Even after all the dough I ate, I just kept eating the cookies. I think I kept justifying it in my mind by telling myself that there’s oatmeal and whole wheat flour in these, so they’ve got to be somewhat healthy. I debated about whether or not to add the cinnamon just because it didn’t sound like it belonged. Trust me when I tell you, it belongs! The cinnamon gives these cookies such a great flavor. It’s really subtle and takes these cookies over-the-top. I am in love with these cookies, so were my boys. Maybe I should call these Gorp Cookies, what do you think? Make these. You will love them! Preheat to 350 degrees. Line a baking sheet with parchment paper, and set aside. In a medium bowl, whisk together the oats, flours, baking powder, baking soda, salt, and cinnamon, set aside. In the bowl of an electric hand mixer fitted with a paddle attachment cream together the butter and sugars until light and fluffy, 3 to 5 minutes. Add the eggs one at a time, beating on medium speed for 1 minute between each addition. Stop the mixer and scrape down the bowl as necessary. Beat in the vanilla until incorporated. Stop the mixer and add the flour mixture all at once. Beat on low speed until just incorporated. 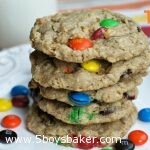 Then add the peanut butter chips, M&M’s, peanuts, and chocolate chips (or raisins). Turn on mixer again and beat the additions at low speed until just incorporated. Remove the bowl from the mixer, and finish incorporating the cookie batter with a spatula. Using a cookie scoop (or your hands) scoop out dough generous tablespoonfuls into balls and place on prepared cookie sheet. Bake for about 13 minutes or until lightly browned around the edges. Remove from the oven and allow to cool on the cookie sheet for 10 minutes before removing to a wire rack to cool. Like I said before, I don't like raisins in cookies so I substituted chocolate chips. Even if you do like raisins, you might want to try adding both raisins and chocolate chips, because you can never have too much chocolate in a cookie, right? !